Setting a million high-stakes resolutions isn’t really a thing anymore (three cheers for mindful goal-setting!). But if there’s just one thing you’d like to crush this year—say, making that occasional morning jog a habit or earning that promotion—you still need a fuel-focused breakfast to make it happen. And you still don’t have an extra 30 minutes in the morning to fire up your oven and cook a full buffet. And you’re not alone in that. 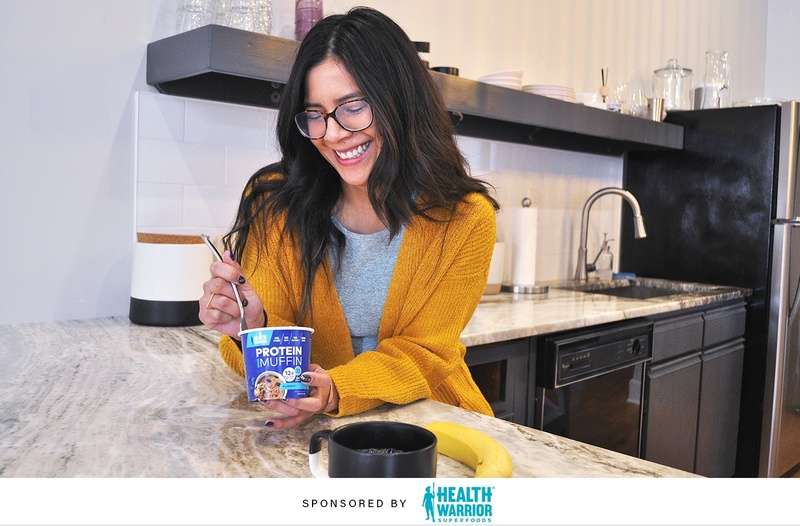 “We heard time and time again that people want a healthy breakfast that’s quick, will keep them full, and isn’t packed with sugar,” says Julia Wing-Larson, VP of marketing and innovation at Health Warrior, which specializes in foods focused on superfood ingredients. Through the company’s research, Health Warrior landed on a balance of protein and complex carbs as the magic formula for making that feeling of satiety last. And from that intel, Protein Mug Muffins—a spoonable, dietician-approved serving of 12 grams of plant-based protein—were born. The recipe includes only 6 grams of sugar, and blissfully requires the bare minimum of lift in the kitchen (you just have to add water, stir, and microwave). But most important is nailing the balance of ingredients your body needs to conquer your to-do list, sans exhausted meltdowns and desperate urges to raid the office snack drawer. “When we focus on real food ingredients, our blood sugars are more balanced which helps to control cravings during the day,” explains Courtney Ferreira, MS, RD. Scroll down to learn the three key factors to a solid breakfast that will keep you out of the hanger zone. Like healthy fats and not-so-healthy fats, there’s a world of difference between complex carbs and simple carbs. For one, it’s essential to fuel up complex carbohydrates for an energy fix. Protein Mug Muffins are made with a mix of complex carbs including sorghum flour, almond flour, and tapioca flour, which help provide lasting stamina (without the sugar crash). They’re sweetened with only a hint of brown sugar and monk-fruit extract, so you’re skipping the heavy doses of sugar found in a lot of breakfast go-to’s like yogurt and cereal. Health Warrior aims to spotlight lesser-known superfoods that pack a big nutrition punch. “We always use superfoods as the first ingredient in our products and think nutrition should come from real food, mostly plants,” says Wing-Larson. If scooping whey protein into your a.m. smoothie or bowl of oatmeal often leads to an upset stomach later in the day, opt for a natural variety of plant-based proteins instead. Every microwavable muffin is loaded with protein from fava beans, pumpkin seeds, and flaxseeds—plus sorghum. Oh yeah, and Protein Mug Muffins offer a full flavor menu—like peanut butter chocolate chip, banana nut, and blueberry—so boredom won’t be a thing. Only thing left to do is grab one and go.